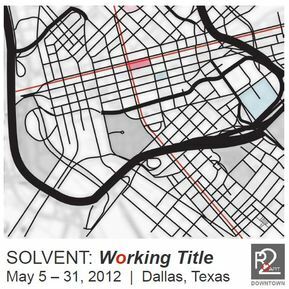 (May 1, 2012) Ro2 Art is proud to present SOLVENT: Working Title, a collaboration of work by 30 Dallas-based artists, working as part of three generations, with three openings: May 5, May 12, and May 19. The complete installation of work will remain on view through May. The exhibition will take place at Ro2 Art's Downtown Projects space, located at 110 N. Akard Street in the Kirby Building. Working Title is an interactive art happening which addresses community involvement, a pertinent concern in the Dallas art scene, by encouraging a lineage of artists within the community to actively engage in evolutionary and collaborative art creation process.